Since last three years the By-pass road connecting Rajbhawan-Ganga Market is need of repair and now is at the verge of collapse. The locals of ESS Sector since long appealing the capital district administration and PWD to immediately repair the portion of road which have been washed away years back for the convenient of the commuters. The locals said that the road was damaged around 2-3 years back due to heavy torrential rainfall and since then it have never been repaired. Even several minor accident have been taken place. An old man said that earlier there was no much traffic in this road. But since when the four lane road is under construction, every one started using this road to traffic jam on NH-415. Even the said road is also being used by the Chief Minister, several ministers, including the officers from administration and PWD but no one is taking any initiative for the general public problem. This road connect the AP Civil Secretariat and Legislative assembly through one road and Ganga Market by another road while the other end goes to Bank Tinali Via DDK, CM Private resident, Circuit House, Ashoka Hotel and to Raj Bhawan also but no one ever think for safety of the commuters as several two wheelers have meet accident. During the peak hours on NH-415 the traffic are being diverted through this road and the commuters and vehicle owners have to face great difficulty and narrowly escape from accident. An old lady who residing near by this road said that last year one of her relative from Palin fell into the deep George which is around 150 mtrs and received serious injuries. One another lady running a shop said that one Scootty driven by a lady fell down in the road side drain and got injuries. One passerby said that these days one ITW have been posted but how long the ITW will be there, if the traffic warden can guide in day and what about in night he observed. He said when the state government is talking about smart city and infrastructure development and four lane road then why they do not repair a small culvert which is seen and used by all section of society including the VVIP and VIPs every day. DC Capital Complex Prince Dhawan informed that the said culvert and portion of roads on one side have been washed away which need sufficient fund for renovation and new construction at site. A proposal which was prepared by PWD have been sent to government as proposed in SIDF and waiting for the approval for a new construction to takes place. Meantime a barricading have been made and warning signboard have been erected on both side of the damaged point for safety of the commuters. The passing of heavy vehicle have been banned and a ITW put up in day while he will request the Power Department for lighting system for night hour for safety of commuters. DC added. 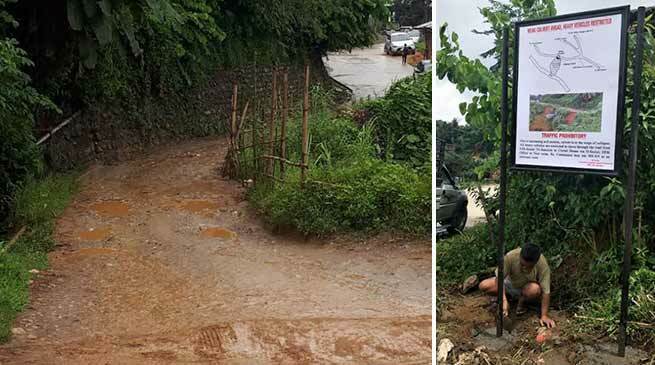 PWD Capital Division B Executive Engineer Tarh Gongkap when contacted said that the road is at the verge of collapse as most of the road portion have been washed away. This road is deteriorated to such an extent and not fit for public use. Some portion of the road may collapse any time if the heavy rain and heavy vehicle plying continue . He also suggested for stopping of vehicular movement at the point of damaged to avert any mishap.